"Incredibly unique modernized adaptations of traditional rhythms of the diverse regions of Sudan, recorded in Kuwait 1980. 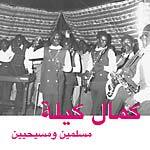 The 'holy grail' album from Sudan. 'I heard about Seif Abu Bakr and The Scorpions maybe 3-4 years ago. Their album Jazz, Jazz Jazz ended up on my radar because of an eBay auction with the bids eventually rising daily up to a staggering 1000$. The music is a unique combination of incredible horn arrangements powerfully performed, a vigorous drummer contributing a funky backbone and Seif's vocals uniting those elements. The results range from instrumental tracks awaking memories of 1970s crime thriller soundtracks to more Sudanese-rooted tracks, a lot of them modernized versions traditional rhythms of the diverse regions of Sudan and even an excursion into Colgolese Soukouss. The jazz scene started to perish after president Nimeiry's turn away from his socialist policies, that he was widely associated with in the first decade of his rule, towards the implementation of Sharia law in 1983. During the first decade of his rule he had actively supported various artists of the Jazz scene, taking some of them on trips throughout Africa. The 1989 coup of Bashir and his generals then caused the final blow to a once thriving scene. Both of these political events within 6 years lead to significant drawbacks for the Sudanese jazz scene resulting into hardly no gig opportunities left and parties and concerts being critically observed. A number of musicians faced prosecution, most of the time for their political views; some left Sudan for good. Music never completely vanished from public life and even the regime kept selected artists close, but for a majority of those bands affiliated to the jazz scene life and making ends became a lot harder. The Scorpions dissolved as a group around the same time. The re-release was produced with a clean copy of the vinyl version as a source. The original reel tape of the album stayed with Saif Abu Bakr along with another reel with other recordings that were never released. Unfortunately it was lost when Saif Abu Bakr had to flee to Kuwait temporarily during the second gulf war when Iraq raided Kuwait. Both the CD and vinyl version come with extensive booklets with photos, interviews, liner notes. The vinyl version also has a DLL code. (Jannis Stuerz / Habibi Funk Records, 2018)." Restocked; LP version; includes download. "Incredibly unique modernized adaptations of traditional rhythms of the diverse regions of Sudan, recorded in Kuwait 1980. 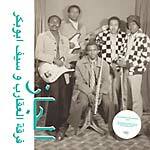 The 'holy grail' album from Sudan. 'I heard about Seif Abu Bakr and The Scorpions maybe 3-4 years ago. Their album Jazz, Jazz Jazz ended up on my radar because of an eBay auction with the bids eventually rising daily up to a staggering 1000$. The music is a unique combination of incredible horn arrangements powerfully performed, a vigorous drummer contributing a funky backbone and Seif's vocals uniting those elements. The results range from instrumental tracks awaking memories of 1970s crime thriller soundtracks to more Sudanese-rooted tracks, a lot of them modernized versions traditional rhythms of the diverse regions of Sudan and even an excursion into Colgolese Soukouss. The jazz scene started to perish after president Nimeiry's turn away from his socialist policies, that he was widely associated with in the first decade of his rule, towards the implementation of Sharia law in 1983. During the first decade of his rule he had actively supported various artists of the Jazz scene, taking some of them on trips throughout Africa. The 1989 coup of Bashir and his generals then caused the final blow to a once thriving scene. Both of these political events within 6 years lead to significant drawbacks for the Sudanese jazz scene resulting into hardly no gig opportunities left and parties and concerts being critically observed. A number of musicians faced prosecution, most of the time for their political views; some left Sudan for good. Music never completely vanished from public life and even the regime kept selected artists close, but for a majority of those bands affiliated to the jazz scene life and making ends became a lot harder. The Scorpions dissolved as a group around the same time. The re-release was produced with a clean copy of the vinyl version as a source. The original reel tape of the album stayed with Saif Abu Bakr along with another reel with other recordings that were never released. Unfortunately it was lost when Saif Abu Bakr had to flee to Kuwait temporarily during the second gulf war when Iraq raided Kuwait. Both the CD and vinyl version come with extensive booklets with photos, interviews, liner notes. The vinyl version also has a DL code. (Jannis Stuerz / Habibi Funk Records, 2018)." "Songs about the unity of Sudan, peace between Muslims and Christians and the fate of war orphans, backed by grooves equally taking influence from Arabic sounds, American funk as well as neighboring Ethiopia. Kamal Keila was among the first artist we met in Sudan during our two trips to Khartoum and Omdurman last year. He is one of the key figures of the Sudanese jazz scene that was a vital part of the musical culture in Sudan from the mid-1960s until the Islamist revolution in the late 1980s. When we meet Kamal he luckily presented us with two mold covered studio reels. Each tape included five tracks. One with English lyrics and another with Arabic ones. Musically you can hear the influence of neighboring Ethiopia much more than on other Sudanese recordings of the time, as well as references to Fela and American funk and soul. His lyrics, at least when he sings in English which gave him more freedom from censorship, are very political. A brave statement in the political climate of Sudan of the last decades, preaching for the unity of Sudan, peace between Muslims and Christians and singing the blues about the fate of war orphans called 'Shmasha'. A note inside one of the boxes specified the track titles, durations and the fact that the sessions were recorded on the 12th of August 1992. Both sessions stand as a hearable testament how Kamal Keila stuck to a sound aesthetic from decades ago, while incorporating current events into his lyrics. Kamal Keila's album is the first in a series of releases covering the Sudanese jazz scene on Habibi Funk. Be on the lookout for albums by The Scorpions and Sharhabeel coming soon." LP version. "Al Massrieen: Disco, funk and modernized Arabic pop from Egypt. In the beginning of Habibi Funk, our search was focused on vinyl records. Around a year ago though, we got to the point where we realized that it became substantially harder to discover music that we enjoyed and hadn't heard before. It became apparent that it was time to start looking for other formats. Cassette tapes were the obvious alternative. These were introduced in the Arabic world around the late 1970s. In some countries they took over a bit earlier, in others a bit later, but eventually they pushed the vinyl format out of the market in the 1980s. In Egypt this trend already even started in the late 1970s. Al Massrieen was one of the first bands I learned about once I discovered the tape format for myself. They were really popular in Egypt in the 1970s and the more of their music I found on either tapes or Arabic pirate mp3 sites, the more I was becoming a fan. Only very few bands from the region can match the band's versatility as well as their strive for innovation. Hany Shenoda is the man behind the Al Massrieen band. He is a renowned figure of the Egyptian music scene and has worked with everyone from Abdel Halim Hafez to Mohamed Mounir. Al Massrieen was his attempt to introduce his ideas of modernizing Egyptian music, heavily encouraged by Naguib Mahfouz (Egypt's only winner of the Nobel Prize for literature) after discussing his ideas with him. Al Massrieen's sound goes from lush disco like 'Sah' to psych rock like 'Horreya' or incredible jazz fused pop on songs such as 'Edba Mn Gded'. I was shocked to realize the band seemed to be hardly known outside Egypt, even though I feel they're at least on the same level as Ahmed Fakroun. A relative obscurity which I largely attribute to the fact that their releases never have been pressed on vinyl (apart from a Greece best of LP which wasn't a strong compilation of the group's songs). One way or another it felt like this band and especially their composer, band leader and overall brain Hany Shenoda was in need to get some recognition outside of Egypt. The release is fully licensed from the band and comes with an extensive booklet with liner notes, interviews and unseen photos." "Al Massrieen: Disco, funk and modernized Arabic pop from Egypt. In the beginning of Habibi Funk, our search was focused on vinyl records. Around a year ago though, we got to the point where we realized that it became substantially harder to discover music that we enjoyed and hadn't heard before. It became apparent that it was time to start looking for other formats. Cassette tapes were the obvious alternative. These were introduced in the Arabic world around the late 1970s. In some countries they took over a bit earlier, in others a bit later, but eventually they pushed the vinyl format out of the market in the 1980s. In Egypt this trend already even started in the late 1970s. Al Massrieen was one of the first bands I learned about once I discovered the tape format for myself. They were really popular in Egypt in the 1970s and the more of their music I found on either tapes or Arabic pirate mp3 sites, the more I was becoming a fan. Only very few bands from the region can match the band's versatility as well as their strive for innovation. Hany Shenoda is the man behind the Al Massrieen band. He is a renowned figure of the Egyptian music scene and has worked with everyone from Abdel Halim Hafez to Mohamed Mounir. 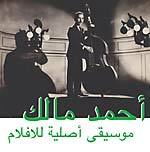 Al Massrieen was his attempt to introduce his ideas of modernizing Egyptian music, heavily encouraged by Naguib Mahfouz (Egypt's only winner of the Nobel Prize for literature) after discussing his ideas with him. Al Massrieen's sound goes from lush disco like 'Sah' to psych rock like 'Horreya' or incredible jazz fused pop on songs such as 'Edba Mn Gded'. I was shocked to realize the band seemed to be hardly known outside Egypt, even though I feel they're at least on the same level as Ahmed Fakroun. A relative obscurity which I largely attribute to the fact that their releases never have been pressed on vinyl (apart from a Greece best of LP which wasn't a strong compilation of the group's songs). One way or another it felt like this band and especially their composer, band leader and overall brain Hany Shenoda was in need to get some recognition outside of Egypt. The release is fully licensed from the band and comes with an extensive booklet with liner notes, interviews and unseen photos." 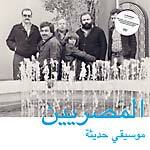 "Unreleased early Algerian synth electronic by Ahmed Malek, compiled and co-produced by Flako. In the early 1980s, Ahmed Malek was already in his 50s, when he discovered synthesizers and electronic music for himself and started to experiment with sounds. The result was a mixture of ambient synth music, field recordings he made in Cuba and a wide variation of different sound experiments that he also presented as different avanguarde music festivals in Cuba and the US. None of it was ever released but we got a huge box of master tapes from his family and we're happy to present this different side of Ahmed Malek's music. It was compiled and co-produced by Flako, a fan of early electronic and synth music. This is not a remix album though, Flako's aim was to create an album out of 2 hours of material that sounds like it might have if Mr. Malek would have finished it himself before of his death. Fully approved and licensed from the artists family. The album comes with an informative booklet with liner notes, an interview with Flako regarding his approach towards the production and unseen photos. We will also release a third album by Ahmed Malek which will be more in the vein again of the music he is known for and this album will also be previously unreleased." LP version. 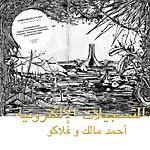 "Unreleased early Algerian synth electronic by Ahmed Malek, compiled and co-produced by Flako. In the early 1980s, Ahmed Malek was already in his 50s, when he discovered synthesizers and electronic music for himself and started to experiment with sounds. The result was a mixture of ambient synth music, field recordings he made in Cuba and a wide variation of different sound experiments that he also presented as different avanguarde music festivals in Cuba and the US. None of it was ever released but we got a huge box of master tapes from his family and we're happy to present this different side of Ahmed Malek's music. It was compiled and co-produced by Flako, a fan of early electronic and synth music. This is not a remix album though, Flako's aim was to create an album out of 2 hours of material that sounds like it might have if Mr. Malek would have finished it himself before of his death. Fully approved and licensed from the artists family. The album comes with an informative booklet with liner notes, an interview with Flako regarding his approach towards the production and unseen photos. We will also release a third album by Ahmed Malek which will be more in the vein again of the music he is known for and this album will also be previously unreleased." "Follow up to releases from Fadoul, Ahmed Malek and Dalton on Jakarta Records' sub label Habibi Funk. 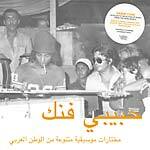 Rare Tunisian disco including unreleased instrumentals, comes with 8 page booklet and download-coupon." "Ahmed Malek - Algeria's Ennio Morricone. Ahmed Malek was one of the most important musicians of the Algerian scene of the 1970s. His soundtrack works that were composed for various Algerian movies of the time fuse Arabic influences with jazz, psych and funk influences. Dark cineastic soundscapes meet African Jazz at times reminiscent of Mulatu. Original copies of his vinyl releases have been sold for enormous amounts. For this release we combined the strongest tracks from his releases with a selection of unreleased material straight from the families archive. The cd version with a 16 page booklet with lot of unseen photos, an interview with the artist from 1978 and an introduction to Algerian cinema." LP version. Includes eight-page 12" booklet. ""Ahmed Malek - Algeria's Ennio Morricone. Ahmed Malek was one of the most important musicians of the Algerian scene of the 1970s. His sountrack works that were composed for various Algerian movies of the time fuse Arabic influences with jazz, psych and funk influences. Dark cineastic soundscapes meet african Jazz at times reminicent of Mulatu. Original copies of his vinyl releases have been sold for enormous amounts. For this release we combined the strongest tracks from his releases with a selection of unreleased material straight from the families archive." "Reissue of very rare Arabic funk music with a punk attitude, for fans of labels like Now Again, Pharaway Sounds, Soundway, Analog Africa, etc. 8 tracks of raw Arabic funk music, none of these have ever been reissued before. So far Fadoul (or Fadaul, or Faddoul, the transcribtion of his name to latin letters differs)& his music had not been rediscovered, as a matter of fact most of those songs still left no trace whatsoever in the world wide web. It took us 2 years and countless trips to Morocco to find the artists family to license the release from them. Comes with liner notes, unseen live photos and lyrics translations."